Hunting season is here: Deer can see more than you think. Its hunting season again! Time to break out those hunting clothes and get those guns ready, but first before you do that, think twice about the camouflage or blaze orange that you plan on wearing. Why? Because you would be surprised at what deer can see and what they cannot see. First, deer have a higher concentration of rods (nighttime cells) than humans, but a lower concentration of cones (daytime and color cells). Therefore, deer have better nighttime vision than humans but poorer daytime and color vision. Second, deer have pupils that open much wider than ours. This allows more light to be gathered in low light conditions Third, deer have a reflective layer in the back of their eye called a tapetum that causes their eyes to shine at night. The tapetum acts as a mirror and reflects light not absorbed by the receptor cells when it enters the eye the first time back across the cells for a second chance. In essence, deer get to use the same light twice while humans get to use it only once. In August 1992, a group of leading deer researchers and vision scientists gathered at the University of Georgia to conduct this landmark study. This study was made possible due to a highly sophisticated computer system that interprets electrical responses produced by the eye and translates them into a “scientific best guess” of what deer can actually see. Our study confirmed that deer possess two (rather than three as in humans) types of cone photopigments allowing limited color vision. The cone photopigment deer lack is the “red” cone, or the one sensitive to long wavelength colors such as red and orange. These colors are invisible to deer, but rather are perceived differently. Deer are essentially red-green colorblind like some humans. Their color vision is limited to the short (blue) and middle (green) wavelength colors. As a result, deer likely can distinguish blue from red, but not green from red, or orange from red. Therefore, it appears that hunters would be equally suited wearing green, red, or orange clothing but disadvantaged wearing blue. The results regarding the UV capabilities of deer were equally fascinating. 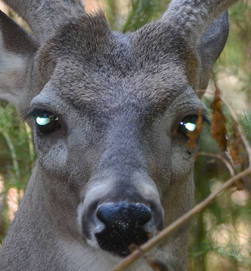 Our results confirmed that, unlike humans, deer lack a UV filter in their eye. In humans, this filter blocks about 99 percent of damaging UV light from entering the eye. It also functions much like a pair of yellow shooting glasses and allows us to focus more sharply on fine detail. The trade-off is a loss of sensitivity to short wavelength colors, especially in the UV spectrum. Because deer do not have a UV filter, they see much better in the UV spectrum but lack the ability to see fine detail. This helps explain why deer often move their head from side to side when they encounter a hunter. So you might be thinking, oh great now I have to throw away all of my camouflage hunting clothing. Don’t do that, just be aware of the findings in this study to better prepare you. There is no question that scent and movement are far more important than the color of your clothing or whether or not it contains UV brighteners. As far as a deer’s senses are concerned, their daytime and color vision is pretty average. In fact, the actual color of the fabric is relatively unimportant as long as the pattern blends with your surroundings. Therefore, camouflage clothing is still recommended. In contrast, solid unbroken patterns, especially of light colors, are not recommended. Similarly, garments made from vinyl or plastic should be avoided because they reflect light much like the glare from a gun barrel. Should hunters be concerned about the UV brightness of their clothes? Probably, since the study revealed that deer can see into the shorter wavelengths were UV light could be noticeable to deer. If concerned about the UV brightness of your hunting clothes, you should first determine if they are “UV-hot.” This can be done easily with the aid of a UV or blue light. If the clothes glow under the light, the UV radiance must be eliminated with a special product made for that purpose. Simply avoid washing them in laundry products containing UV brighteners and you will be fine. Happy Hunting!